Beautifully appointed two bedroom and two and a half baths. 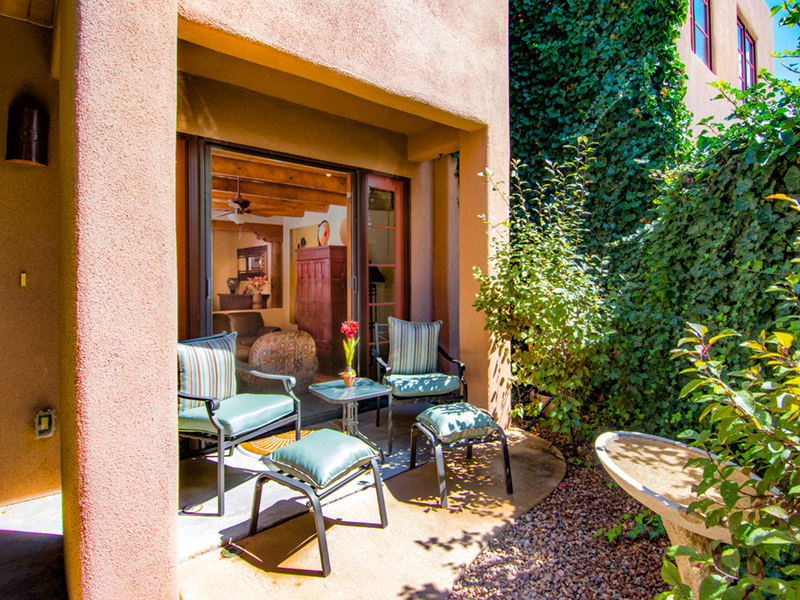 You won’t find a better location to the Santa Fe Plaza! Come stay at Quiet Luxury at El Corazon where you will find a well-appointed condo offering all the Santa Fe flavors you want to enjoy. For a three bedroom option, you may choose Downtown Delight which is accessible from the guest bedroom to the deck which adjoins the upstairs unit. Sleeping could accommodate up to 12 guests with these adjoining units. The décor reflects the culture of our beautiful southwest. Tile floors, fireplaces, vigas, hand plastered walls. Original art. This condo is approximately 1500 sq. ft. with two private patios. The living space is downstairs with comfy sofas around the fireplace and TV where you can relax, watch a movie or read a book. One of the sofas opens to a queen sofa bed in case you have the overnight guests who will seek you out while in Santa Fe! From the living room are a set of French doors with entrance to the front patio with comfortable seating. Adjoining the living room is a formal, yet comfortable dining area to enjoy a feast or simple breakfast. The well-appointed kitchen is complete with granite countertops, beautiful cabinets, gas stove and all kitchen supplies. From the kitchen, you will find another set of French doors opening to the dining patio where you can sip your morning coffee. From the entry, you will be greeted by a beautiful stairway guiding you up to the bedroom suites. You will get a wonderful rest in the king suite with professionally decorated linens and cozy comforters. The master suite has a flat screen TV, gas fireplace, and large bath with Jacuzzi tub. The queen bedroom has a queen bed, TV and bath with a walk-in shower. 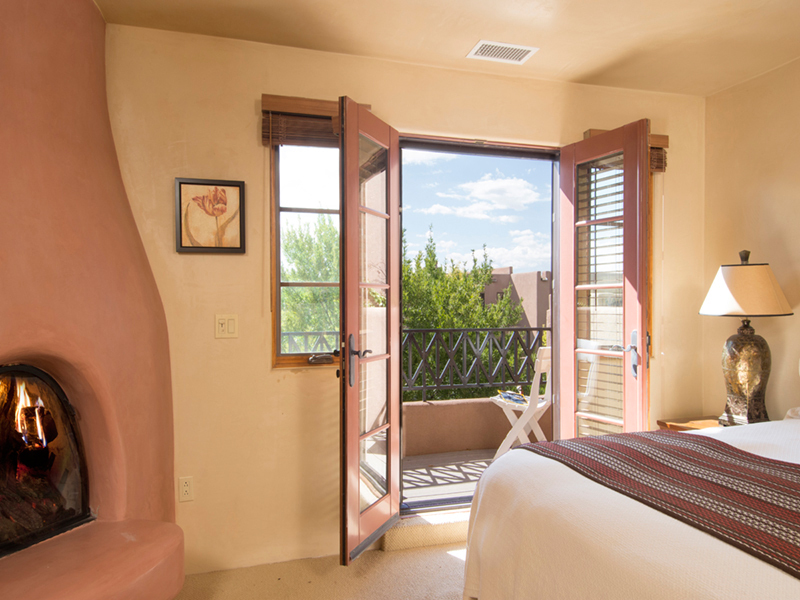 Both bedrooms have ample closest space and you can peak at the views and big skies of Santa Fe! 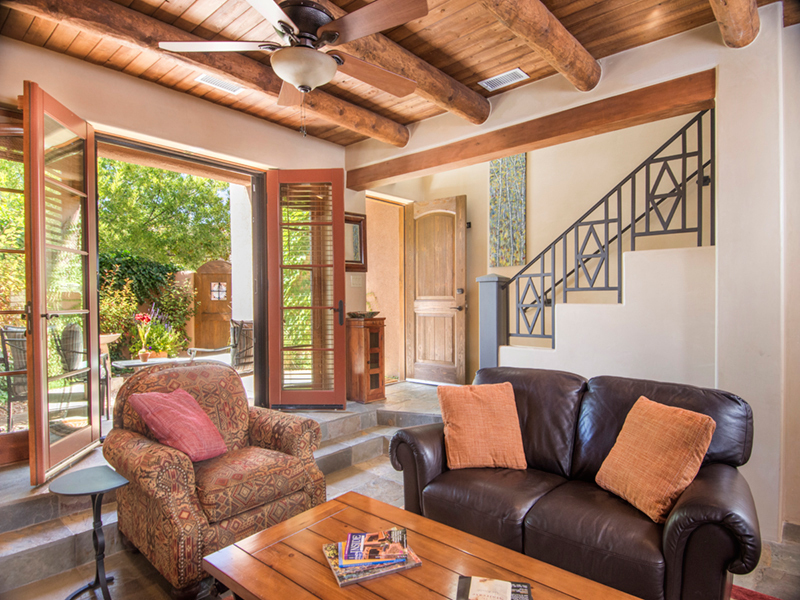 The property boasts tile floors, vigas, fireplaces and stainless steel kitchen. The on-site gym is available for all guests.